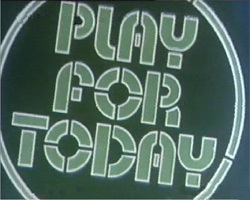 Play for Today was a strand of single dramas on BBC1 which, even now, remains a byword for ‘serious television’. 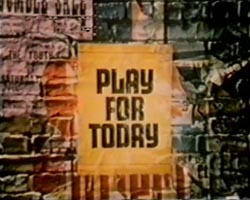 It grew out of the Beeb’s great dramatic success of the 1960s (and Sidney Newman’s rival to his own Armchair Theatre on ITV), The Wednesday Play. The two current series producers on the strand – Irene Shubik and Graeme MacDonald – were carried over, along with many of the same writers. The change was down to a practical scheduling matter – he schedules needed freeing up in the late evenings, most significantly for Sportsnight, so the day-independent monicker was adopted and for the rest of its run, with a few exceptions due to special events, strikes, last-minute cancellations and the like, the strand went out on either Mondays, Tuesdays or Thursdays. Critics baulked at the move at first – did a lack of commitment to a regular slot imply an ebbing away of support for the strand in general? Fortunately, the next fourteen years of the new series would render these worries largely unfounded. If anything, the new name reaffirmed Newman’s initial commitment to providing uncompromising new works of drama addressing modern issues. 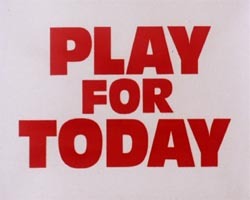 Play for Today was in no danger of flagging. Wednesday Plays like Cathy Come Home and Dennis Potter’s various works had set the agenda so quickly that by 1967 the Guardian could define that, while BBC2’s Theatre 625 strand was largely concerned with adaptations of the classics, The Wednesday Play “is for beating the bourge oisie around the head and shoulders.” The bourgeoisie evidently lapped it up, though – figures for the early years averaged out at a shade under four million, and remained respectable through the first seasons of Play for Today. Edna, the Inebriate Woman, for instance, attracted an audience of 9 1/4 million – not the kind of figure you’d expect today for an uncompromising look at down-and-outs in darkest Hackney. The vices of Play for Today were in abundance too, however. Think of the cliches people were associating, almost automatically, with the strand by the late ’70s – a single mother bawling her eyes out in the dingy corner of a council flat; a bunch of earnest young Trotskyites with bushy moustaches and even bushier girlfriends gathering on picket lines; a middle aged man clutching his head and screaming like a dying cat in his recently-destroyed front room as the screen goes all wobbly; a family huddling together in a makeshift nuclear bunker as The Big One finally goes off overhead; a silver suited, colour separation-saturated imaginary future where nobody works, eats real food or speaks with apostrophes. All really did happen, though often (but by no means always) with a twist, a new angle, or at least some underlying intelligence that populates the old scenario with real people. 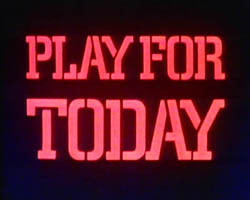 “Themed” runs were instigated too, like executive producer Margaret Matheson’s 1978 series of plays based round public issues, which sounds stifling, but with plays as varied as including The Spongers, The After Dinner Joke, A Touch of the Tiny Hacketts, The Legion Hall Bombing and Victims of Apartheid among the results, the strength of the writing more than justified it. Left-wing political stances were dominant of course, and with it came a rather odd and stuffy argument about technique. The ‘naturalist’ style, commentators argued, with its desire to present fiction as documentary fact, was in danger of stymying awareness of the possibility of social change by presenting, say, the plight of single mothers in The Spongers as a fait accompli, a state of affairs set in stone and therefore not worth questioning or acting against. Of course, a random sample of realism from this strand should be enough to repudiate this hopelessly detached bit of theory, but it’s also worth noting that the ideas over-theoretical academics like Raymond Williams proposed to remedy this situation – Brechtian fourth wall-breaking, “showing the frame” and suchlike – could often lead to cloistered, hopelessly self-indulgent pieces of work that bore little of no relation to the world they were supposed to be drawing from. In the hands of someone like John McGrath, non-naturalism can be a powerful tool. But then McGrath cut his televisual teeth on the staunchly realistic Z-Cars. The ‘naturalism’ debate was a theoretical cul-de-sac that fortunately TV strands like Play for Today managed to resist somewhat better than the theatre world. 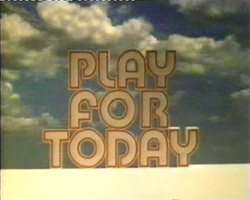 Among the big names, Dennis Potter made possibly the biggest impact, with Double Dare, Brimstone and Treacle (even though it wasn’t shown at the time) and the brilliant Colin Welland-in-shorts childhood reminiscence Blue Remembered Hills, which was to be his last Play for Today as serials (beginning with Pennies from Heaven) be ckoned. Mike Leigh made good with Nuts in May and Abigail’s Party, but it would take a few more years before their cult status really took off. Elsewhere Jack Rosenthal and John Mortimer were waxing wry, and Roy Minton, Jim Allen, Barrie Keeffe and Alan Bleasdale were going for the jugular. Most importantly perhaps, the strand was continuing to provide exposure for first time and amateur writers such as Peter McDougall, who chanced upon his first commission while painting Colin Welland’s house. The writer/director/producer team as a creative unit was in full force here, and with directors of the calibre of Loach, Clarke and John MacKenzie on the books, quality was pretty much guaranteed along with experiment and innovation. With the 1980s came two factors that were to aid the slow death of the strand. Visually, things were slipping. In many late plays – the science-fiction plays, of which there were more in the ’80s than ever before, being the prime examples – the old low-budget techniques were beginning to look tacky and dated, especially when, as was often the case by 1982, the strand was interrupted for runs of lavish mini-series like Shogun. Cost was another factor. The BBC’s accountants begin to take a closer interest in the contents of plays, especially before commissioning them. Room for experiment in the script, and exploration of themes not likely to attract a mass audience, or a respectable one – the key tenets of Play for Today – become much harder to get through the system. Other factors, like the birth of Channel Four, also took their toll, though Play for Today was already breathing its last by the time Four’s drama output got into its stride. While it lasted, the final phase of the strand put out some excellent stuff. The Black Stuff is undoubtedly the most well-known, mainly through the spin-off series (if you’re wondering why 1983’s output seems especially impoverished, that year also took in Bleasdale’s mini-series). Sci-fi plays like The Flipside of Dominick Hide and Z for Zachariah were massively popular with a young audience, as, to a lesser extent, were the Plays for Tomorrow. Respected hits included The Imitation Game and Country. More bizarre fare scored in the shape of The Adventures of Frank, The Kamikaze Ground Staff Reunion Dinner, and A Brush with Mr Porter on the Road to Eldorado. Thatcher’s activities in the economy, Northern Ireland and, latterly, the Falklands, provided more political subject matter, as did the preoccupation with the Thames flooding. 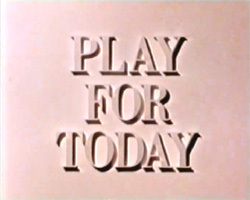 From its roots in the very beginnings of television drama, when producers pulled new talent (literally) off the streets and a playwright could live quite comfortably producing two works for television every year, Play for Today had succeeded in uniting (or at least brigning together) the popular with the experimental, the respectable with the wayward, the underground with the drawing-room. A prime evening slot on the country’s most-watched channel was privy to drama more daring and amazing than most stuff on today’s limited release arthouse circuit. 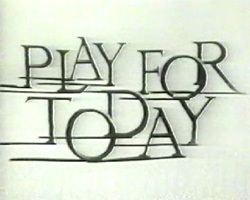 When Geoffrey Palmer’s hidebound military fantasist Jimmy listed Play for Today alongside Wedgewood-Benn and ‘keg bitter’ in his demented hit-list in The Fall and Rise of Reginald Perrin, it was a sign of the slot’s stature in national consciousness – many became converts to the slot, many more most likely switched off in bewilderment, but the figures show a majority of the viewing public must have at least ‘given it a try’ at some time or other. When management curtailed the ‘right to fail’ of TV drama, they clipped its wings to an extent – with one eye perpetually on phantom overnight ratings, the heights that Play for Today and its fellow (and indeed rival) strands had reached would seem even further away. At the risk of romanticising old telly (perish the thought!) serials – the backbone of ‘serious’ TV drama more so than ever now – just don’t have that unique, hermetic, often slightly skewed aura of the single play, the great joy of which is seeing it introduce its entire world, run the c haracters through their paces, and bring itself to a conclusion – then disappear, never (in most cases) to be revisited, continued or recycled. ‘Bubbles’ of drama that are gone almost as soon as they arrive aren’t good business, but for our money they make the best telly. Great drama is still being made, of course, but the rigmarole of production now irons out every potential crease or kink, and the ad hoc variety that had been, despite the stereotypes of lefty propaganda still parroted by bottom-feeding broadsheet hacks, Play for Today‘s real hallmark, may never be recaptured on TV to such an extent again. Here, in chronological order, including those ‘unofficial’ entries in the canon that vex the pedants so inexplicably, are all three-hundred-plus entries in the greatest drama series known to mankind. Does anyone know if it is possible to purchace all or some of the plays ? Are there any plans to bring out a box set of D.V.D’s for example? Some vendors on the iOffer website sell DVDs of old telly that hasn’t been officially released – I’m sure I’ve seen a few Plays for Today on there. There also some on You Tube. I’ve watched quite a few of them.